The education market has never been more inundated with classroom technology. Education organizations need tools that save time, save money and improve outcomes as they expand their students’ access to digital learning solutions. As such, the importance of education technology management (“edtech management”) platforms that help organizations achieve these goals is steadily on the rise. With that rise comes some confusion, particularly when compared to tools that offer single sign-on (SSO) authentication and rostering (for example, Clever or Classlink). Comprehensive edtech management is the complete set of systems, policies and processes an education organization has in place for finding, buying, managing and measuring the value of edtech across its digital learning ecosystem. Effective edtech management expands equitable access for all students to the safest and most effective learning technology. Edtech management activities for high-functioning organizations include product discovery, inventory management, internal request and approval workflows, vetting tools for compliance, purchasing and procurement, access and authentication, interoperability, implementation of tools across the learning environment, structured pilots, rapid and ongoing evaluation, and other coordinated activities. When implemented effectively, these activities can lead to improved instructional, operational and budget decisions. Depending on their stage of maturity, some organizations may use manual or “hacked” tools and systems (e.g. shareable spreadsheets, email, wikis, or even social media) to support their policies and processes for edtech management. This, however, can waste valuable time and decrease your return on edtech investment. Self-diagnose your organization’s stage of edtech management maturity today. What is Single Sign-on Authentication? Single sign-on authentication (SSO) is one part of the technology integration process organizations use to save teachers and students time in accessing digital tools (see graphic below). Systems like Clever, Classlink, Google for Education and others provide a technical solution that enables students to access multiple applications once they are authenticated. These SSO platforms offer these technical solutions under different business models, and as with any solution, organizations should understand the providers’ business models to determine which can provide the best return on investment for their instructional, operational and budget goals. Rostering is the process of sharing student-level data (usually about class assignments, demographics, etc.) from a Student Information System (SIS) to other application(s) used by a school or district. SSO platforms like those mentioned above offer rostering as well as authentication, and use agreed-upon, governed, data integration standards (e.g. IMS OneRoster, EdFi SIS Certification) to support automated data sharing between applications. The ‘product access’ benefits offered by tools that provide SSO authentication and rostering are a valuable accompaniment to the benefits of a comprehensive edtech management system. Which Systems are Best for EdTech Analytics? As use of edtech expands, the importance of understanding what’s being used, how much, how often, and in which situations those tools and practices are having the biggest impact continues to grow. These analyses can inform instructional, operational and budget decisions. 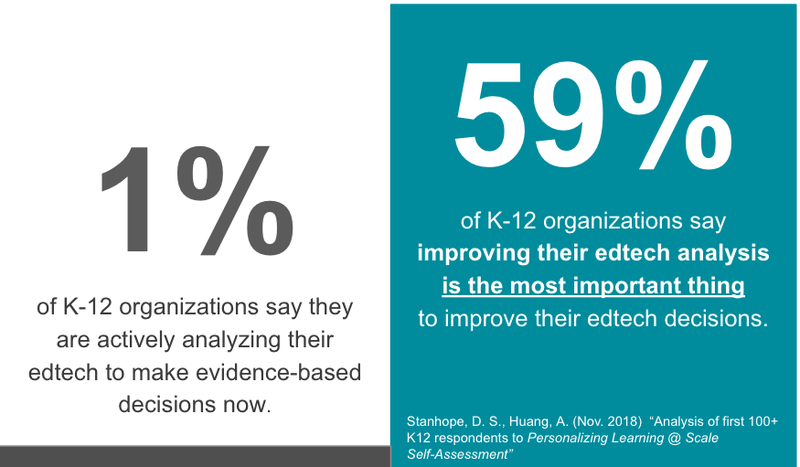 In fact, 59 percent of K-12 organizations say improving their edtech analysis is the most critical step toward improving their edtech decision-making — yet only 1 percent of organizations say they are effectively and continuously analyzing their digital learning inventory. When considering edtech management and SSO platforms, it’s important to understand the data and analyses provided by each. Terms like “usage data,” ”edtech efficacy,” “ROI,” “rapid evaluation,” “fidelity of use,” and “dosage” are often misused, being dropped as buzz words that cause confusion when discussing true analytics. Each of these terms represents a very different aspect of measurement and analysis, as well as the breadth and depth of those evaluations. For example, while some SSO platforms provide basic-level analytics using login/access data (i.e. visuals based on SSO authentication), an edtech management system like LearnPlatform assess both the total number of tools (breadth) using access integrations and their depth of use, providing insights into resulting impacts on student learning, instructional practices and your organization’s edtech finances. 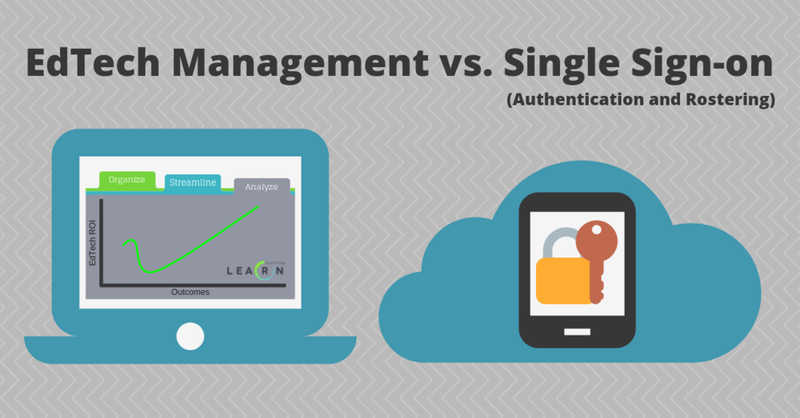 EdTech Management or SSO: Which Do You Need? While SSOs certainly address some of the pain points associated with edtech use (like logging in, helping with password management, communicating SIS data), an edtech management platform provides more comprehensive control of your digital inventories, compliance with reporting and regulatory requirements, deeper and more actionable data on product effectiveness and more options for finding, purchasing, managing and measuring edtech. That’s why most organizations that use LearnPlatform also use one or more SSO providers for authentication and rostering. If you’re overwhelmed with the amount of digital learning tools being used in your organization or stringent student data privacy requirements, LearnPlatform can help. It provides unparalleled quantitative and qualitative insights that help you fully manage edtech inventory, while also ensuring you stay aligned to all state and federal privacy regulations. Sign up for a free LearnPlatform account today or schedule a personalized demo with a district analyst to explore the wealth of benefits a comprehensive edtech management system can provide you — like saving time, maximizing edtech ROI and improving outcomes for all learners.